The hellebore or Christmas rose family consists of approximately 20 species of herbaceous or evergreen woodland perennials, many of which have become popular garden plants because of their tolerance of shade and habit of blooming very early in the year when there are few other flowers around. They are not related to the true roses, but are in fact members of the buttercup family. The elegant flowers are wonderful for brightening up a shady area during late winter and early spring, while the striking evergreen foliage of some of the species remains as an architectural feature all year-round. Others are deciduous and start flowering as the fresh foliage emerges, often in the depths of winter, miraculously surviving frosts and even a snow covering. What appear to be the flowers’ petals are actually five sepals. These surround a ring of small, cup-like structures that are the petals that have been modified to hold nectar. Unlike most flower petals, the sepals are long-lived and may remain on the plant after flowering, sometimes for a number of months. In the wild, hellebores are most commonly found in woodlands and woodland glades on the lower slopes of European and Balkan mountains. They are adapted to life in snow fields, and deal with snow melts by inhabiting freely draining, sloping areas. They are natives of deciduous woodlands with trees that shed their leaves in winter, allowing winter and spring sunlight through the bare canopy to the community of plants growing on the woodland floor. This provides a good guide to the conditions that gardeners should aim to give them. The most popular Christmas roses for the garden are Helleborus niger and H. orientalis, including its many colourful hybrids (H. × hybridus). This vigorous Christmas rose grows in clumps up to a metre tall, and produces lots of very attractive purple double flowers from late January to April. ‘Harvington Apricot’ produces outward-facing, rich apricot flowers from February to April. The flowers contrast beautifully with the glossy, dark-green leaves. It will form good ground cover in areas of dappled shade under deciduous trees and shrubs. The stunning, almost black flowers of this variety provide a great spectacle in the winter garden, especially as they are just bursting from the bud. The flowers vary from outward facing to pendulous, and have a rich, velvety appearance that is reflected in the purple-tinged, deep-green leaves. This very hardy variety has large blooms with pointed white ‘petals’ that are very lightly marked with maroon, surrounding a prominent central mound of creamy stamens. This is an ideal variety for brightening up a gloomy shaded border in the winter. This traditional cottage garden favourite and RHS Award of Garden Merit winner has low-growing, deeply cut, leathery foliage that provides year-round interest in a shaded bed or woodland garden. The white, sometimes slightly pink-tinged flowers appear from mid-winter until early spring. The aptly named stinking hellebore has large clusters of pale green, nodding, bell-shaped flowers with purple edges that are held above the divided, dark-green leaves. The foetid smell is given off when foliage is crushed. 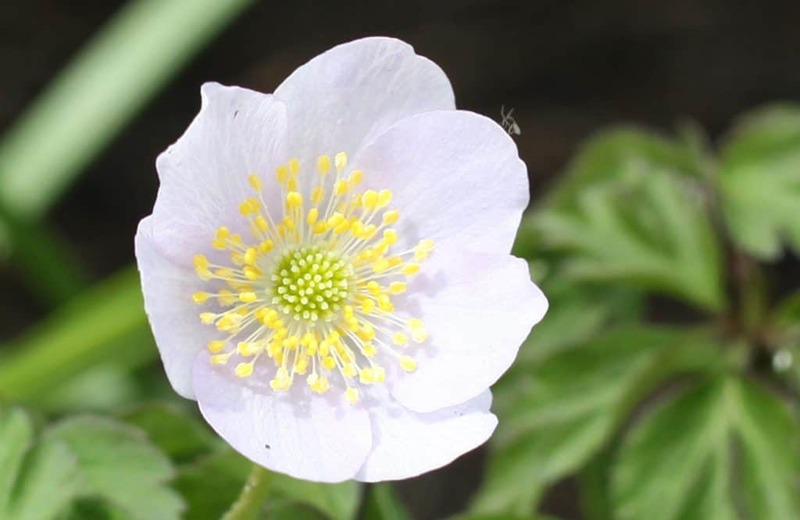 The cultivar has the RHS Award of Garden Merit, and is related to a native British chalky woodland wildflower. It has an interesting subtle architectural form that provides winter interest in a shady border or woodland garden. ‘Winter Moonbeam’ is a hardy evergreen hybrid between H. niger and H. corsicus. Its long-lasting, creamy white flowers are produced from late winter right through to early summer, providing great value and appeal. The abundant, creamy white flowers of ‘Winter Sunshine’ fade to a delicate pale red and will decorate a shaded border or deciduous shrubbery from February through to April. It has received the RHS Award of Garden Merit. This hardy and early flowering deciduous variety may start to bloom in December, with the first few reddish-purple flowers appearing near ground level before the foliage emerges. It has characteristic red-blotched stems that add further colour and interest to the shaded border. It grows into dense clumps and makes good ground cover. 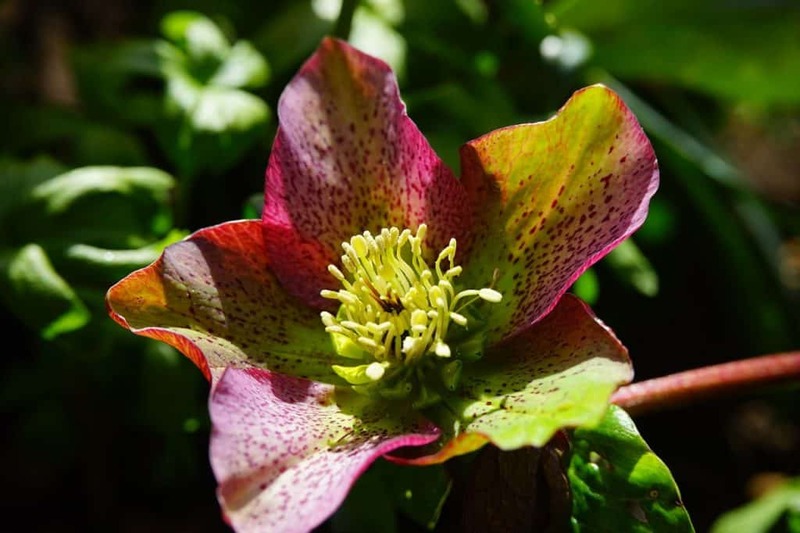 While hellebores are available from specialist nurseries all year-round, they tend to appear in garden centres in late winter to early spring and this is a good time to plant them out. They are not always reliable when produced from seed, and many enthusiasts only buy plants in flower to ensure that they are coloured as expected. Choose a position in the garden that is lightly shaded and well drained, but sheltered from cold, winter winds. As woodland plants with long root systems, hellebores like deep, rich soils with a lot of organic matter, so dig a good amount of well-rotted manure, leaf mould or garden compost into the soil before planting. They have a preference for slightly alkaline soils, so spent mushroom compost is particularly suitable. Dig a hole at least twice the diameter and depth of the container, incorporate organic matter and three handfuls of fish, blood and bone into the base of the hole and work it in. Backfill with enough compost-enriched soil to ensure that the plant will be at the same level as it was in the pot. Carefully knock the plant out of the pot and place it in the hole, filling around the roots with the rest of the soil. Firm the soil gently around the root ball and water well. Keep the plants well watered during the first year in the ground, and give them a 5cm deep mulch of well-rotted organic material such as leaf mould or bark each autumn to keep them weed-free and to keep the soil in good condition for them. Christmas roses are prone to a variety of fungal diseases and they benefit from the removal of any dead or dying leaves in late November or December. This improves air circulation around the base of the plant and reduces the chances of fungi establishing. It also improves the chances of seeing the first new flowers as they emerge near ground level in the New Year. Any dead stems can also be taken off after flowering in March or April, again to minimise the risk of fungal diseases establishing. As the plant is so prone, it is best to dispose of any removed leaves or flowers rather then to put them on the compost heap. The flowers are readily cross-pollinated and they will seed freely around the parent plant. However, the offspring are typically inferior plants with poor-coloured flowers, and if allowed to establish they can take over from the parents. To prevent this, many gardeners cut the flower stems off their specimen plants before the seed pods ripen and split. In a less formal situation such as a woodland garden or deciduous shrubbery, a growing colony of more nondescript plants may be more acceptable. Hellebores do best in dappled or semi-shade, in a sheltered site away from cold winds. Dense shade will reduce the number of flowers, especially if it persists all year round. They are best grown amongst deciduous shrubs and trees that will allow them sufficient light in the winter and spring but provide shade in the summer. Christmas roses are not tolerant of drought, so they should be watered occasionally in dry weather, especially on free-draining soils that are not water retentive. An annual application of organic matter to such soils will gradually improve their water holding ability, though the mulch should be kept clear of the crowns of the plants to avoid rot. Hellebores do well in most soils although they will not survive waterlogged conditions and will struggle in very dry soils. Their preference is for a rich, organic and slightly alkaline soil but if looked after they will do quite well in garden soil of any typical acidity. A deep loam with lots of organic matter is ideal. They are hungry plants and should be fed with general purpose fertiliser or fish, blood and bone annually in March after flowering. Sprinkle this onto the soil around the plants at the rate of approximately 50g per square metre and then gently work it into the soil surface with a fork. Container grown plants need even more feeding. A high potassium fertiliser such as tomato feed will encourage flowering. Hellebores are naturally deep-rooted plants, so they generally do not grow well in containers. For the best chances of success, start a new plant of one of the shorter varieties in a pot that is at least 50cm deep, and re-pot every two years into a pot that is at least 5cm deeper. Use good quality compost such as a John Innes No 2 with added horticultural grit, and ensure good drainage through basal holes covered with a layer of broken crocks. A final pot depth of 70cm should be sufficient for a full-grown plant. While the proportions associated with a relatively small plant in a tall pot can sometimes look odd, it is possible to add a permanent tall component such as a dwarf conifer, and the height of the pot has the added advantage of bringing the welcome winter flowers closer to eye level. Keep the pot well watered and a twice-yearly feed with a high potassium fertiliser such as tomato feed will encourage flowering. Seaweed fertiliser can also be used. 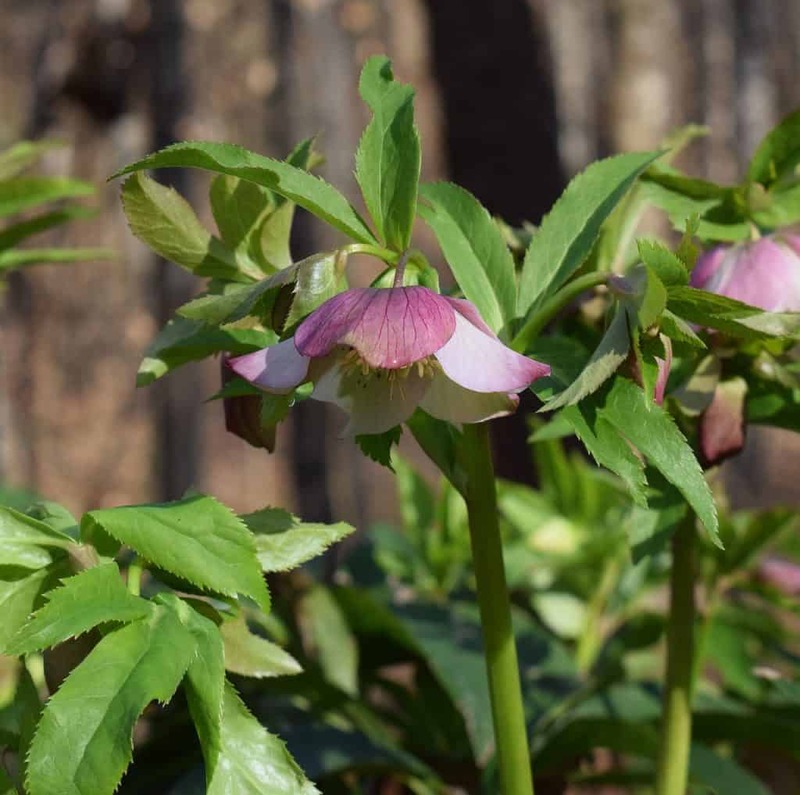 Densely-planted evergreen hellebores can be used to create ground cover in shaded areas, and the deciduous types look good as part of a mixed woodland floor planting with companions such as snowdrops, spring snowflake, wood anemones, violets, primroses and barrenwort. The evergreen varieties can provide year-round interest in spring bulb beds or large containers, and their flowers will add variety to miniature Narcissi, Erythroniums, and the blues of grape hyacinth and Scillas, especially when planted with the spikey foliage of hardy ferns such as Dryopteris and Polystichum. Christmas roses do not need pruning as such, but for good plant hygiene the foliage should be removed in October or November to prevent fungal diseases being carried through the winter and infecting the flowers. Exposing the flowers in this way will also make it easier for recently emerged insects to find and pollinate the flowers. The plants can also be tidied up generally after flowering. The dead flowering stems of stinking hellebore (H. foetidus) and H. argutifolius can be cut off at ground level, but other hellebores should simply be dead-headed. Seed-grown hellebores can be unreliable and vary in colour from expectations. While cheap seed is available and it is very easy to germinate and raise plants, it is unlikely to provide good examples of the more unusually-coloured varieties and it is likely to produce a lot of very average-looking plants. Seed is the only practical way of raising Helleborus foetidus and H. argutifolius for amateur gardeners. It may take two or three years for seed-raised plants to flower. Unlike many hardy perennials that benefit from lifting and division every three years or so, the deep-rooted hellebores are best left to mature into large clumps and not split. However, with exceptions, named cultivars and most of the species can be divided to produce more plants in early spring. The exceptions are Helleborus × hybridus, which should be divided in September, and Helleborus foetidus and H. argutifolius, which are not suitable for division. After careful lifting, digging deep to try to keep as much root as possible, the clumps should be split into pieces with at least one growth point, using a sharp, sterilised knife. The pieces should be replanted as soon as possible and watered well until they are established. Due to the inevitable root loss, the new divisions can take some time to establish and flowering may be reduced or absent for the next couple of years. Hellebores are prone to the usual slug and snail problems, especially when young, and they can also be affected by number of family-specific pests and diseases. The hellebore aphid is a sap-feeding greenfly that can affect the flowers and foliage of the plants. They are most active in March and April before many aphid predators are active. The first sign is often white flecks on the underside of the leaves: these are the shed skins of the insects. The aphids produce a sticky, sweet honeydew that attracts ants and can facilitate the development of sooty mould and other fungal diseases. Insecticides or organic alternatives can be used with care to avoid any beneficial insects visiting the later flowers. Another specific pest, the hellebore leaf miner became established in Britain as recently as the 1990s. The fly larvae burrow into the foliage of Helleborus foetidus, causing brown lines and blotches, and eventually disfigurement of the leaves. While sustained attacks can lead to most of the foliage being damaged by spring, the plants do not seem to be permanently harmed. Helleborus net necrosis virus is a serious disease of Christmas roses and can cause stunting and deformity in the plants, especially those that are at least three or four years old. It is also known somewhat dramatically as ‘Hellebore black death’ because of the black streaks, veins and ring markings that it causes. There is no cure so infected plants should be dug up and destroyed. It is thought to be spread by aphids, and is typically more of an issue for nurseries and extensive commercial plantings of stinking hellebore than individual garden plants. Hellebore leaf spot (or black spot) is a common disease of fresh growth caused by the fungus Microsphaeropsis hellebore. Symptoms include round brown patches on the leaves and tiny black fruiting structures may be visible on close inspection. Helleborus argutifolius is quite resistant, but H. niger is particularly susceptible. Any affected leaves should be removed promptly and destroyed. Good garden hygiene will be necessary to reduce the chances of outbreaks in successive years. Q I am looking for good early spring nectar plants for my wildlife garden. Are Christmas roses any good? Single-flowered hellebores produce lots of nectar and will attract bees at a time of the year when little else is available for them. Planting Christmas roses in the wildlife garden will help early bumble bees and overwintering butterflies that are emerging from their winter quarters.